Teachers here in New England are savoring these last days of August before the school year starts. Teachers in other parts of the country are already back in the classroom. 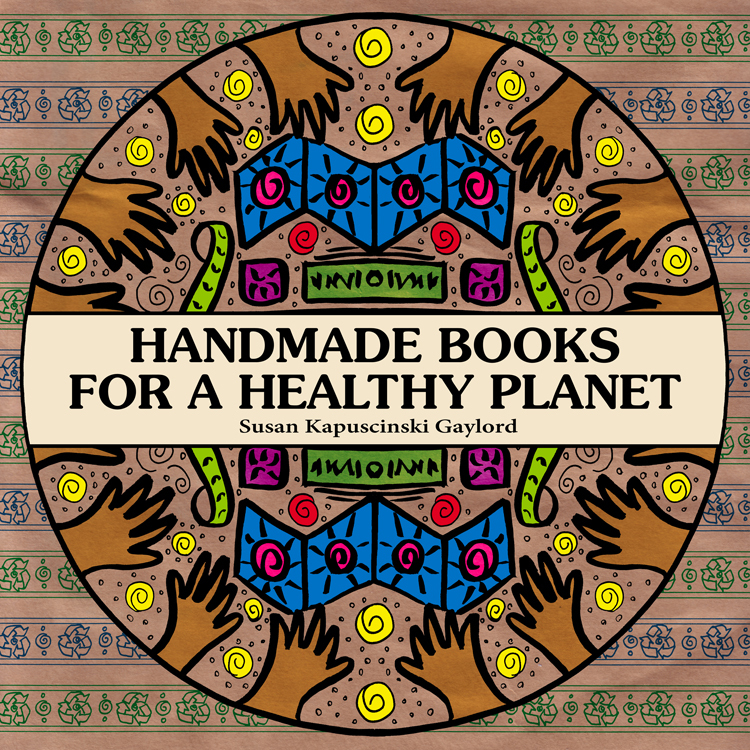 In honor of all the good work they do, here's a giveaway for Handmade Books for a Healthy Planet: Sixteen Earth-Friendly Projects From Around the World. 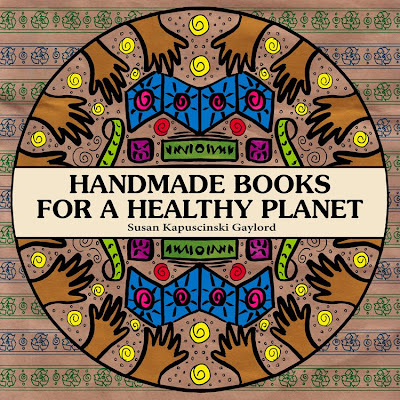 Handmade Books For A Healthy Planet is a how-to book with a purpose. 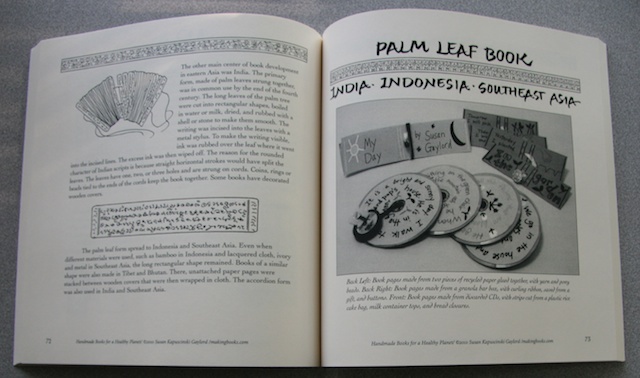 With fascinating facts about the history of books and illustrated step-by-step directions, the sixteen earth-friendly projects, including a Wish Scroll from Ethiopia, a Medieval Book of Hours and a Book of Haiku from Japan, promote cultural understanding and environmental awareness. Here's a Sampler of pages from Handmade Books For a Healthy Planet. Leave a comment before midnight on Tuesday and be entered into a random drawing for a copy of the book. Make sure the comment contains your email address so that I can reach you. To purchase a copy, go to Itasca Books. I am savoring the last few days of summer but also looking forward to teaching crafts and a few new bookbinding units. Looks like a fun book. Would love to win it and share it with the children I teach at a nature center. make books so I would love to try these projects! Susan, I'd love to have my name added to the give-away! I've been making (and teaching) book making for a long while but would love to add this book and its ideas to my library (and classes). I've admired your books for a long time now and often turn to your website for inspiration for my own books. Thank you for sharing your spectacular art work! it's Wednesday here but I think it's still Tuesday there so I'll throw my hat in the ring too. Love your work and all you share! Mo. Actually meant to say Wednesday at midnight. Glad you put your name in. thanks for all that you do. I tell other teachers about you all the time and would love to win a copy of your book. This night of the blue moon is a good a night as any for wishful thinking about a chance for this precious gift. I first found you searching for book format ideas for my students and I always like the surprise of opening your emails to see what you might inspire in me next. Thank you for your work. OMGosh school started in Hawai'i on August 5 & summer screeched to a halt. Classes begin visiting the library this week, ready to register for library cards, borrow books & listen to stories. What happened to our 3-month summer vacation of not-that-long-ago? Love to keep learning along w/ our keiki (children). Mahalo for the op to win. I am savoring the last bits of summer, and thinking ahead to my new class. I love using so many of your ideas in my classroom --- we LOVE books! I would love a copy of your book to have for my own. Would love to win a copy of your book, its on my wishlist at Amazon. It's always a pleasure to receive your inspiring words. I had a fulfilling time teaching a class about Matisse and his collages at NPL. Children ages 4-6 created collages after "The Snail." I found that origami paper was great for delicious saturated colors. Would love a copy of your book. Having discovered Susan's art work through her Spirit Book collection, I bought some of her innovative instruction books which I have used to teach book binding workshops to the local community. Susan is a wonderfully kind and generous lady who is also a brilliant book artist and an amazing teacher too! I depend on this book for all workshops I give down here in Argentina. But more importantly, I depend on it as a source of inspiration, creativity and enthusiasm! Four major concepts (bookbinding, historical structures, recycling, different cultures) woven into one book that provides simple, straight forward projects. Amazing! As an art therapist I use the technique of making books with my clients frequently. Your knowledge and sharing has made it a joy. This book would be great for my elementary art kiddos!! I consider myself fortunate to have attended your workshops. My students and I love your projects. It would be great fun to add this book to my collection. Thanks for the opportunity. This loks like a great resource! Put my name in and I will put the book to good use this year in my classroom. Thanks to all for the comments. I love that so many people are doing bookmaking in so many different contexts. Wonderful! The book goes to Melanie.